Coffee. I love it. I love the aroma, the sounds of it brewing, the rich flavors, and of course the pick-me-up. Coffee makes me feel happy, calm even. I hear the irony in that statement. Coffee has caffeine, which can agitate anxious people into an even more anxious state. Me however, the whole ritual involved and the clutching of my warm coffee cup like a comforting “woobie” actually relaxes me. The caffeine perk is also welcomed by me in the morning when I feel like a sloth who can’t keep up with the barrage of morning thoughts flowing from my enthusiastic and happy child, or my husband running through the logistics of the day with abandon. All the while, I either want to crawl back deep under the covers and hide with my youngest son, or bulldoze everyone out of the way to reach the morning cup of calm wakefulness. Aaaah, yes, first sip. Now I can hear what you are saying. Now I can try and keep up with the pace of the morning spinning around me. What happened to me? I used to revel in being a morning person! My caffeine perk is also reserved for the last five miles of any race. This of course, assumes I am not racing anything less than a 10k. I hold tight to the promise of the pick-me-up from my one-hundred milligrams of caffeine from Double Espresso CLIF SHOT energy gel. Personally, I prefer to get my carbohydrate energy during long runs from my CLIF SHOT BLOKS and Electrolyte drink. Gels however, THIS GEL, is reserved as a quick delivery system of caffeine. It is a signature move of mine. My secret weapon (that I am now telling all about) to lead me to the finish line. Being a middle-of-the-pack-kind of runner I am hardly propelled to win but, I so love the satisfaction I get from running the last five miles of a race faster than any of the other miles. These are what runners refer to has “negative splits” . It takes me five slow miles to warm up but, in the finish it pays off and I have an extra boost of caffeine on hand to mask signs of fatigue that are inevitable after running for hours and hours. Needless to say, when I took genetic test that would identify whether or not I should even be consuming caffeine at all, I was nervous. Every good dietitian knows we are all individuals and what works for one person may do nothing for another. Most of nutrition comes down to the fact that we are all individuals and, one persons elixir could be another person’s poison. Now we have more than trial and error as a tool to find out where on the spectrum we land. We have access to genetic markers in our DNA. There are several genetic markers for caffeine. 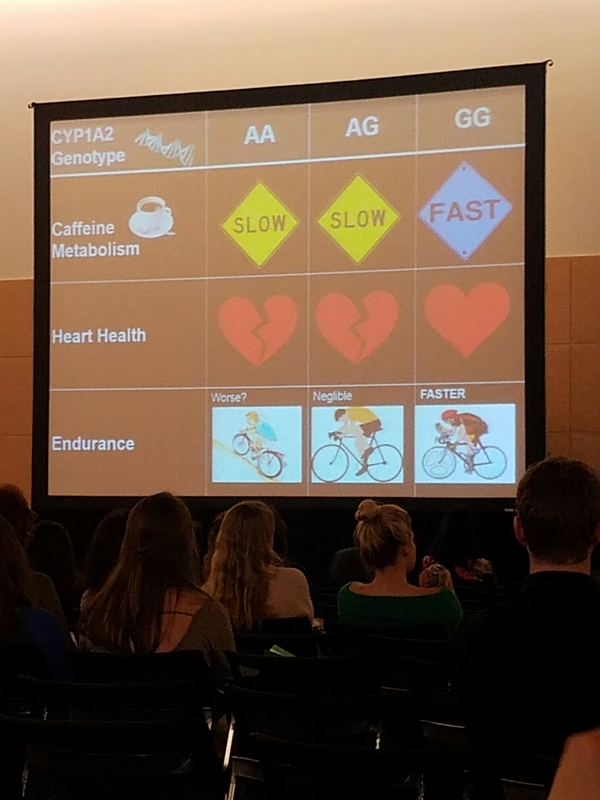 Science has known through performance testing of athletes that caffeine doesn’t benefit everyone and can actually hinder performance of others. Now, we have a genetic tests that helps us dietitians explain why. Some individuals have the gene associated with fast metabolism of caffeine. Those who metabolize it quickly have improvements in athletic performance. There are also a two genes associated with slow metabolism. Depending on which of the two genes a person has for slow metabolism caffeine intake could do very little, or even hurt performance. Additionally one of those slow metabolizing caffeine genes is also associated with cardiovascular risks. Genetics testing is another tool in the toolbox of getting down to what individuals need. Media headlines in nutrition have everyone believing it is one-size-fits all. It is not. It is one-size-fits-you and you will still need to do some alterations as you go. So where does that leave me and my love for coffee and caffeinated gel at that end of a long race? Is my reduced perception of fatigue hurting, harming, or do nothing? As I suspected, and hoped was right, I am a fast metabolizer who gets performance benefits from my boost. Phewww! Here is a little screen shot summarizing what my key take-aways from researcher Nanci Guest‘s talk at a nutrition conference. Genotypes: ultra slow, slow, and fast metabolizers.